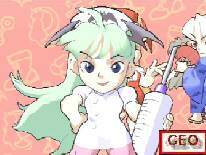 I'm sure you've waited a long time to see Morrigan dressed as a nurse, but I bet you didn't expect her to be so...cute! Strongest woman in the world AND a member of S.T.A.R.S.! Is there anything Chun Li can't do? Ken and Ryu are back, and cuter than ever! To get Capcom's Puzzle Fighters take one part Tetris and mix well well with equal parts Darkstalkers and Street Fighter. Now take the resulting Puzzle Fighter, mix two more parts Darkstalkers and Street Fighter and...voila! Capcom's Pocket Fighter! Basically the rules are simple. Much like other fighting games, one round is limited to 99 seconds, during that time if you deplete your opponent's strength to 0, you have knocked him out and you win. Each hit you score makes gems pop out of your opponent, and the amount of gems you collect powers up your super moves. What makes this really different from other fighting games is the irresistible cuteness inherent in the game. The characters have the same proportions as those in Puzzle Fighter, oversized heads, lil chubby bodies and stubby limbs. While only 12 characters are making their appearance as playable characters, the backgrounds hold many Capcom cameos, from Mega Man to Breath of Fire 3. And while performing flash combos, you can see your character change into a variety of costumes, from Morrigan as a nurse to Zangief as a construction worker. The music and the sound effects basically mirror the lightheartedness of the game. In the stage of DJ's bar the music will have you, like Cammy, virtually bouncing in your seat. The characters unfortunately announce all their moves in Japanese, which is my only complaint but perhaps more people understand Japanese than I do. The play control is smooth and the necessary combos and special moves are easy to master. You'll have a lot of fun even just in the training mode discovering all the different combos you can put together and the different costumes that result. Several different modes of play are available. First you have to choose between Pocket Fighter and Edit Fighter. Once selecting Pocket Fighter, you have your choice of Arcade mode, the basic fight through 8 opponents to view your character's ending, Free battle which is the versus mode (why they don't just call it that I don't know), the Running Battle where you try to defeat as many of the 12 opponents as you can, and a Training Mode where you can get used to the play control and your character's moves. Then of course there is an Option Screen where you can set everything ranging from difficulty to game speed. One of the new innovations on this game is the Edit Fighter. Edit Fighter allows you to develop your own custom character based on a series of questions that determine attributes such as personality and skills to pit against opponents in several CPU only battles. It's not as much fun as controlling the fighter yourself but it's entertaining having Capcom evaluate what kind of fighter someone with your personality would be, and to pit them against other fighters that your friends create. In all this game has many things going for it. The girls outrank the guys 7 to 5 and seems to be geared towards what girls may want. It's cute, it's fun, it's a fighting game from Capcom. What more could you want?